The Executive Notebook is a flexible bound A4 Notebook/Journal with a laminated cover and stitched binding for lasting quality. It opens perfectly flat aiding in ease of note taking and has double margins for noting dates, actions etc. 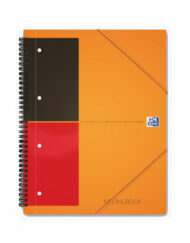 Every notebook contains 80 double sided pages available in graph or ruled. Fountain pen friendly 80gsm paper is used for quality and lighter weight. The top of each page has a multi-purpose area for indicating the subject of a meeting, the date or other information. As with all Oxford International notebooks the inside front cover has international information such as time zones and international calling codes.